There wasn't enough red in this room! No really, my mission wasn't to add more red in the keeping room, even though red is my favorite color. I just thought it would be nice to have a little color in front of the fireplace opening and that's when something in my stash came to mind. So in came more red. There was another change too. This small table was between the two red chairs in the keeping room, but no more. A basket full of red geranium adds a little summer pizazz to the fireplace. The small table was replaced with one made from sewing machine drawers. I burn candles until there's nothing left and as you can see...this one is almost finished! I love it when things from the stash can be used and think it looks much better with flowers than just the black opening, don't you? Thanks so much for coming by, your visits and sweet comments make my day! Hope you have a wonderful weekend and hope to see you back for AMAZE ME MONDAY! So pretty, Cindy. Everything you do is just beautiful. It's lovely! 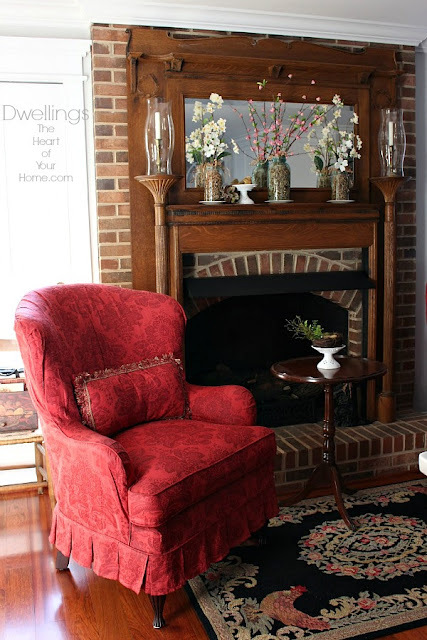 That extra pop of red really pulls the area together and makes a comfy, cozy spot. 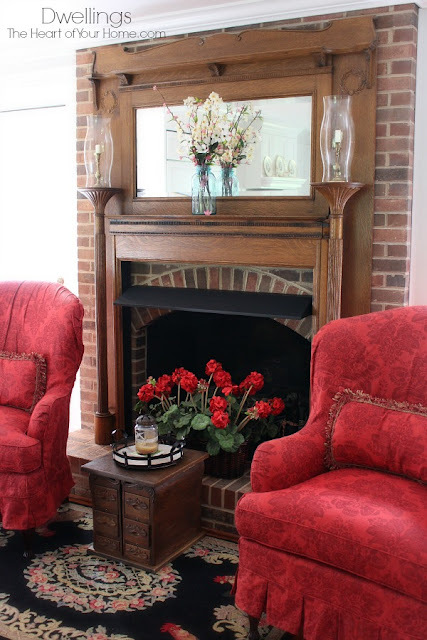 I adore the PoP of red in your fireplace box, dear friend!!! Truly, I never noticed the red accents of your rug before!!! Such a pretty place to sit and chat in your lovely home!!! That table made of sewing machine drawers is uniquely brilliant!!! Oh, my, Cindy! This is so pretty! 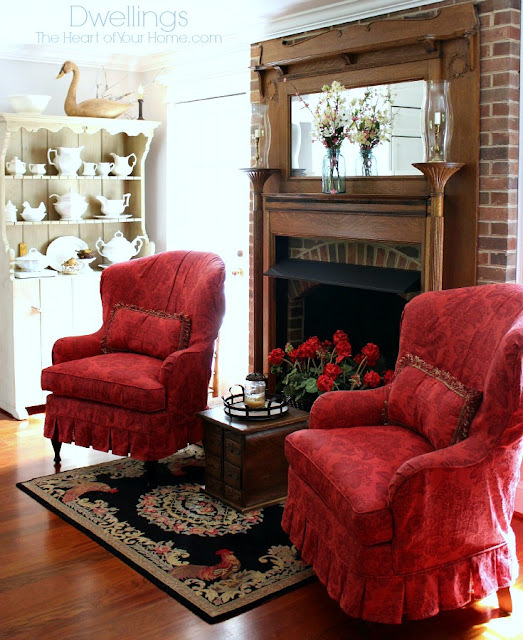 I adore those red chairs and how wonderful they look sitting on your gorgeous rug. The little drawers table is fantastic. I just love seeing your beautiful home and hope you're having a nice Fahter's Day weekend. 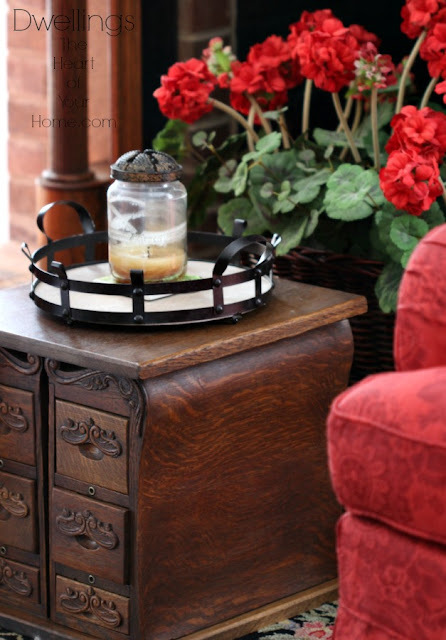 I love that table of sewing machine drawers!...Such a unique piece...and the geraniums look great in the fireplace to add such beautiful color! I already loved the red chairs and the geraniums look great with them. And that table is awesome! I love that look, Cindy. What a cute idea to add some flowers to the fireplace! That's a perfect way to fill it with color and beauty when it's way too hot outside to even think about an actual fire. 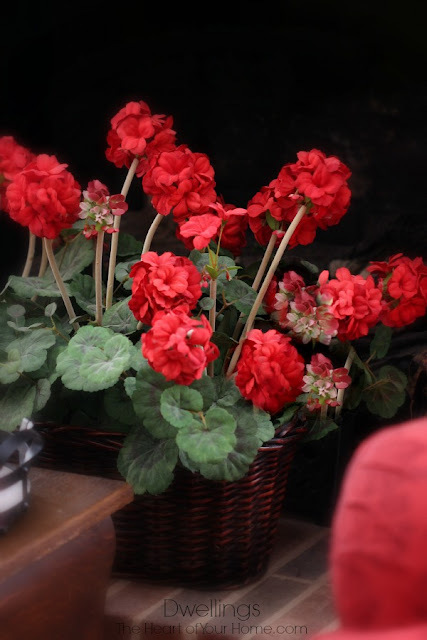 Red is my favorite color and your geraniums add the perfect touch! That room is just beautiful! Thanks for sharing at Home Sweet Home!